Following the attack on Facebook, Forrester has now unleashed its latest findings on Twitter just as the latter is about to go public. This time around, the Forrester report claims only 55% Twitter marketers are “satisfied with the business value they achieve”. The results are from its Digital Maturity Online Survey done in North America and the UK, where it surveyed 397 interactive marketers and e-business professionals. This was the same study from which it derived results for its earlier Facebook report. The report has been criticised for its lack of scale. The report on Twitter both questions the network and how the marketers on it are using it. It said that while it “must do more” to deliver better tools and insights, “many marketers target the wrong objectives” when using the platform. Brand awareness is the wrong objective, said the report. Most marketers hope that Twitter can help them build their brands – but consumers who engage with brands on social media are already customers of those brands, it said. “This means that marketers would have more luck using Twitter to reduce churn and drive greater lifetime value from their existing customers,” Nate Elliot, VP of Forrester said. Yet, only 13% of Twitter marketers said that increasing customer loyalty was their primary objective. The report also added that Twitter’s audience is smaller than marketers think. While Twitter reports that it has 230 million monthly active users, the number of people most marketers can target on the site is actually much lower. This is because many Twitter accounts are created for corporate rather than individual use and the average Twitter user maintains more than one account on the site. “When they do the math, most marketers will find that Twitter offers them a chance to reach tens of millions rather than hundreds of millions of people,” Elliot said. More over, the report claims that Twitter isn’t offering marketers enough support. Just 44% of marketers say they are satisfied with Twitter as a marketing partner — considering the guidance, education, service, and support they receive from Twitter as well as how much Twitter contributes to their marketing success. While Twitter earlier launched a free analytics platform for marketers in June this year, the study also claims that it lacks measurement capabilities still. 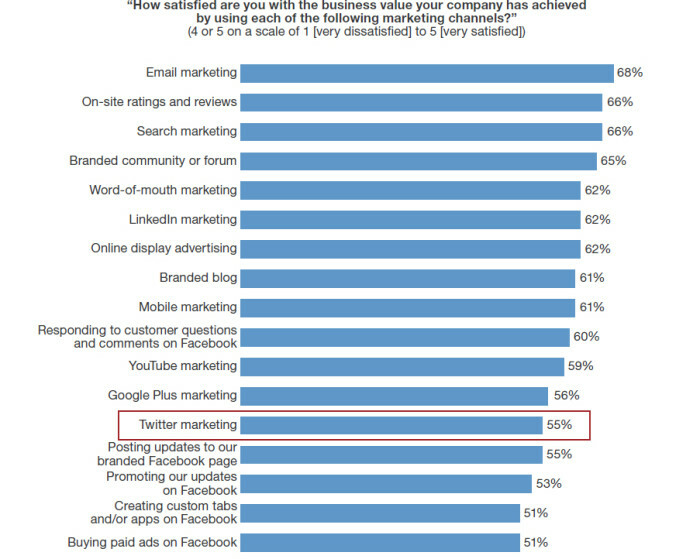 Only 54% of Twitter marketers said they are confident they can measure their marketing efforts on the site, far behind the number who are confident they can measure email or search marketing, the study said. “Twitter’s success as a marketing channel is not yet guaranteed. Twitter’s devoted user base and broad mainstream awareness have given it the opportunity to court marketers. But the company’s viability as a marketing channel has yet to be proven,” said a note in the study. The report was based on a survey of 395 marketers from companies based in the U.S., Canada and the United Kingdom with $500 million or more in annual revenue, conducted in August.